Previous Post“The Real Thing” in RED at Disney’s Animal KingdomNext PostDoo, doo, doo, lookin’ out my back door at the SKY! What an interesting photo! Very nice capture and I like all of the little bubbles. What a very interesting photograph. I like the detail also. Thanks for sharing this, I enjoyed it very much. Interesting photo. Sand, water, and things that wash ashore make for great textures. Very cool shot, thanks for sharing. What in the HE double hockey sticks is that thing??? Makes for a great picture though!! I’ve never been to Sanibel, but I hear it’s just beautiful. Cool photo, too. I wonder what that creature looked like before it became it became an artifact. What sort of shell do you suppose it was when it was whole? Now you have me wondering. 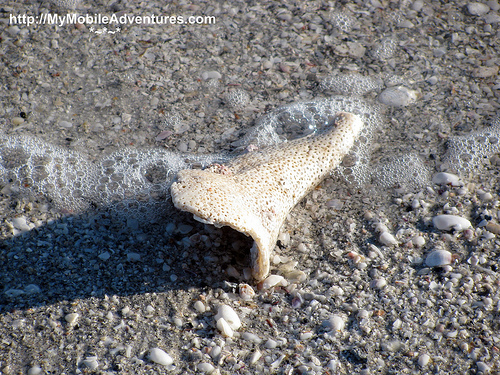 Ah you brought me back to Sanibel, and you know I love it here! Great capture! I love the foam of the water on the shell, you must have captured this just as the tide pulled away! Truly lovely. Cool shot! I love Sanibel Island! Great shot. Wouldn’t you have loved to have seen the shell in all it’s original glory. I bet it was a beauty. What a delicate little picture 😉 I love seashells, sea life, surf and sand so it was perfect for me. This is a pretty one, your picture is nice. Thank you. I am sitting out of WW this week, I am way behind with reading and commenting as it is. Maybe next week.